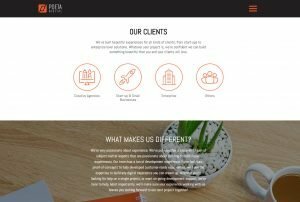 Poeta is a digital development agency in located in Seattle, WA. They specialize in developing digital products, user interfaces, apps and anything else that runs on code. Poeta was looking to update their brand and grow their business in a big way. 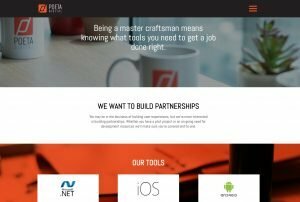 Before Poeta Digital was Poeta Digital, they were Vinasource; a digital developer with overseas assets that helped them outsource development work and keep costs down. Their brand story was very centered on price with technical proficiency, and their development resources a close second and they were looking to make some changes. We helped them develop a new name, brand, story and visual language for their company. Vinasource became Poeta Digital: “makers of beautiful user-experiences” who treated code more as poetry than machine language. 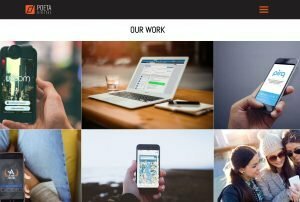 We worked with them to give their website a complete overhaul: refocusing their story so their customers were the heroes of their story, and updating the visuals to showcase that work. Getting to work with Poeta was a lot of fun, and hugely rewarding. They continue to craft better and better user experiences for their clients; empowered by a powerful story and fresh brand that truly reflects the vision of their company and their wonderful talent.